It’s probably not the Hangouts update Android users have been expecting, but Hangouts 4.0 rolled out today for iOS users and brings a slick new user interface and a few other tricks along with it. While we have yet to hear a peep out of Google, we’re crossing our fingers that an Android version isn’t too far behind. With “Update Wednesday” soon approaching, it could be no more than a few days away although we wont get our hopes up. Maybe Google will finally allow Android users to send video clips — like they already do on iOS — as well? Does Google update their apps for iOS first because that’s where the users are or because it’s easier1 on iOS? Or is it a little bit of column A, little bit of column B? With an update released last week, Dark Sky, my favorite iOS weather app and data source, puts weather data collection in your hands. 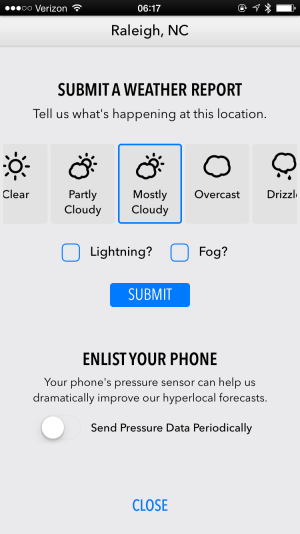 The updated app can now utilize the barometric sensors in the iPhone 6 and iPhone 6 Plus to collect weather data and allows you to report conditions in your location. These new data collection options are opt-in only and the makers of Dark Sky aren’t ready to talk about what or how the data will be used, but they hope to tell us more about it soon. Report weather in your area. 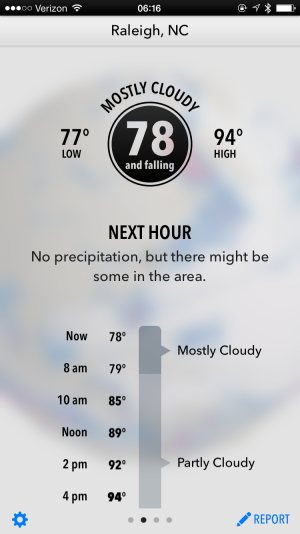 The update also brings customizable alerts and a slightly tweaked UI that enhances hour-by-hour conditions display and incorporates new metrics into that view; adding wind, humidity, and UV index forecasts to the list that already included temperature and chance of precipitation. Great update to an already fantastic app. Three of my favorite apps saw fairly notable updates last week so I thought I’d highlight the changes and use that as an opportunity to promote the apps. They’re all paid apps, but totally worth it in my opinion. First up is one of my all-time favorite apps and the first “expensive” app I ever purchased for iPhone, Instapaper. Created by Marco Arment, but now in the capable and prolific hands of betaworks and lead developer Brian Donahue, Instapaper has seen a steady flow of updates since being sold off by Arment1 and the app just gets better and better. Last week’s update gives us Notes, the ability to add comments or annotations to highlights in the app. As I’ve been blogging more frequently (and in more places), I’ve been relying on Instapaper more and more to help me organize reference and direct links and to jot down notes or comments that I want to make sure I remember about each link or article. Up until now, I’ve been hacking my way with comments but editing the article summary in Instapaper’s web app or by highlighting passages and trying to remember later what it is I found interesting about that specific passage. Now with Notes, I can add my thoughts and associate them directly with each passage and then reference those comments later when I sit down to write. Next up is Tweetbot 2 for Mac by Tapbots. Tweetbot 2 for Mac has been teased for a while now and it finally saw the light of day last week, the week before WWDC. That’s somewhat notable because Tweetbot 2 is the Yosemite-inspired redesign of the application, and the Yosemite design aesthetic entered our collective consciousness just a year ago at last year’s WWDC. A redesign like this is significant, though, and it was executed very well, fitting right in with the new look of Yosemite. I loved the unique shape of the old dock icon, but the more square icon of Tweetbot 2 is a nice reminder that this app has a fresh new design. Relatively speaking, Tweetbot 2 isn’t cheap at the now-reduced price of $12.99, but if you are a heavy Twitter user and, especially if you have multiple accounts, it is well worth the price. Columns, a staple feature of Tweetbot version 1, is improved in this new release with a new, more obvious icon (a rectangle divided into columns replaces the old gears icon) and gives you quick options for commonly created columns. I love using columns for multiple accounts and especially for special events like the upcoming WWDC where I can create a column with a specific hashtag search. Finally we have Fantastical 2 for iOS, by Flexbits, which now includes a bundled Apple Watch app. The Watch app is getting great reviews so far, and is a great alternative to the built-in calendar app. Due to WatchKit limitations, it doesn’t feature a complication that you can add to a watch face, but it does give you access to your reminders, which, curiously, is something Apple doesn’t currently provide through any stock Watch apps. Sadly, I don’t have an Apple Watch (yet), but if/when I do decide to get one, Fantastical will definitely be front and center in my app cloud. I remember reading about Timeful when it first hit the App Store and thinking, “Wow, I think they’re on to something.” I never tried it out because I didn’t want yet another calendar app, quite happy with Fantastical 2. Still, thoughts of a calendar, to do list, life managing application efficiently filling in all the gaps in my schedule stood out to me as an idea from the once-distant, yet ever-encroaching future. Fast forward to this week and perhaps Google sees this as the future as well, acquiring Timeful in a Sparrow-like done-but-not-dead-yet acquihire1. I’m no oracle, but it seems to me the future of time management and to-do apps is going beyond timely reminders or manually entered due dates, but intelligent, automated scheduling of tasks. Google already has the information sources (Calendar, Gmail, your search history), now it has at least the beginnings of the intelligence. It sseems like a great match and I look forward to seeing what comes of the acquisition. Studio Neat, the team behind the Cosmonaut and the Glif, is slowly building a cocktail accessory empire. Highball, a free iOS app for saving and sharing your favorite cocktail recipes, joins the already stout cocktail friendly lineup that incluces the Neat Ice Kit and the Simple Syrup Kit1. The app is simple, yet aesthetically pleasing; common traits for apps and hardware coming from Studio Neat. Recipes are given the common and familiar card treatment, a tried and true metaphor for something that needs to be easy to organize, access and share. And that’s exactly what you do with Highball. Provide your own favorite recipes by typing them into the card or by grabbing a recipe from a friend. You can even use the app to piece together an icon to represent your drink, complete with common glass styles, ice preferences, and beverage hues. I don’t often venture far from the Old Fashioned / Manhattan on the rocks realm, but I assure you if and when I do find something else that I like, I’m going to keep track of it in Highball. Get Highball today in the iOS App Store.